Looking for 91 Series Backshell? SEE and COMPARE the benefits of EA Series 308 Competitive Products! Electro Adapter Series 308 is a Tool-less shield termination, circular Spring Backshell, terminates individual wire bundle shields and the over-all braided shield common with multi-conductor cables. Available for most Military connectors, Electro Adapter’s Series 308 Constant Force Spring, circular holds 125 min pounds of pull to AS85049 at the same time meeting the demand for low resistance to the Military Specification. A convenient way to terminate cables in the shop or, in the field. 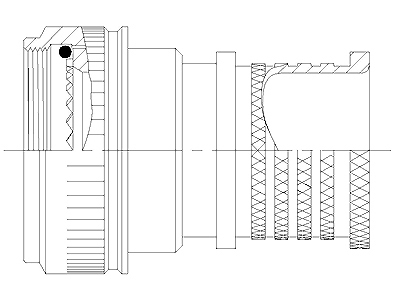 The 308 Series Constant Force Spring Adapter is suited for all applications where second end cable assemblies need to be routed then terminated. Or, where testing cables need to be modified repeatedly. 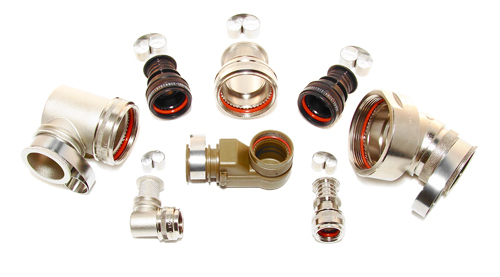 The fast assembly process reduces labor touch time by 50% and makes re-entry to a connector an easy task! We ship the backshells with a spring in each bag that is the proper size and fit. These Series 308 Adapters are designed to meet and exceed AS85049 with pull strength and low resistance backshells in mind. These popular environmental Spring Backshells were originally designed with TACOM U.S. Army Tank Command and Electro Adapter for the M1A1 Abrams Main Battle Tank. Since then it has its rightful place on new versions of the Abrams, Stryker and Bradley fighting vehicles.